Posted: Fri May 06, 2016 6:26 pm Post subject: Re: Fender 'Competition Stripe' guitar straps! I can't work out whether or not these are shite. 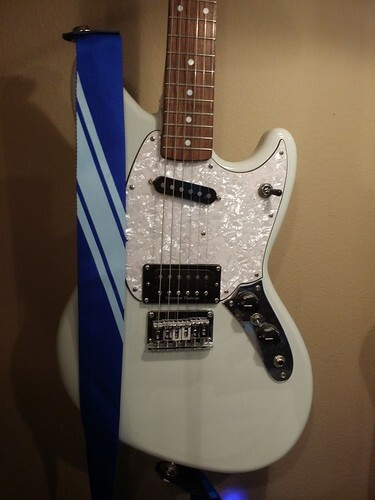 Posted: Fri May 06, 2016 7:27 pm Post subject: Re: Fender 'Competition Stripe' guitar straps! I like it, minus the sales hyperbole. Grabbed a white one cause it looks cool and a blue one to go with my lpb competition stang. for some reason, these make my heart hurt. In a negative fashion. Pics of the blue one � when it arrives � on your Mustang please! somewhere, rodvonbon is rolling in his grave. I prefer to think he's rolling on the floor laughing. It doesn't quite match the color of my '69. 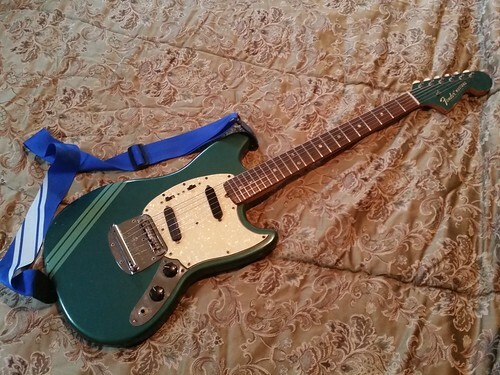 It looks better on my custom Jag-Stang. Thanks for the photos. It's a shame the shades of blue don't match � stupid Fender. The stripe being at the 'top' of the strap makes sense to me because it's visible from the front when the guitar is being played. No offence to HNB but they look worse on the guitar than on the advertisement. No offense taken. I didn't design them, just got a couple to see how they look. The white doesn't match either. 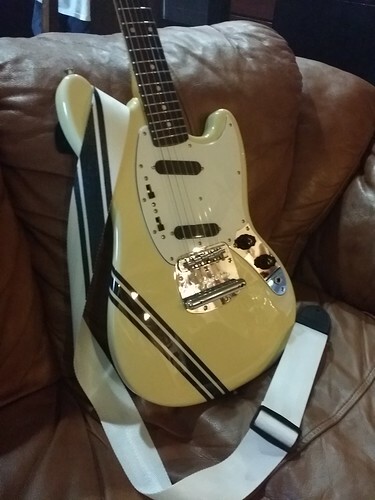 The strap is white and black and the guitar is yellowed white with blue stripes. Throw the blue one in the washing machine with some super-cheap green t-shirts.